RICHARD SOLOMON ARTISTS REPRESENTATIVE: Edward Kinsella - Introvert or Extrovert? Edward Kinsella III just finished this illustration for Briefings Magazine. It asks, who makes a better CEO? An extrovert or introvert? 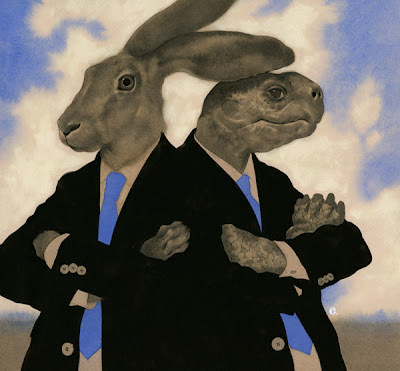 Edward wisely chose to illustrate the concept as the tortoise and hare, the story where the introvert wins the day.